Historical work on the late nineteenth and early twentieth centuries suggests that as nation-states were solidifying throughout Western Europe, exiled groups tended to develop rival national identities-an occurrence that had been fairly uncommon in the two preceding centuries. 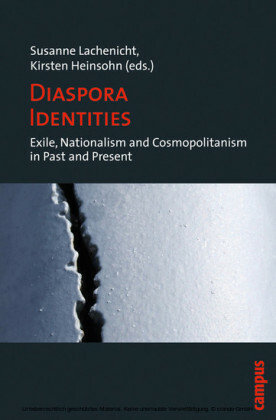 Diaspora Identities draws on eight case studies, ranging from the early modern period through the twentieth century, to explore the interconnectedness of exile, nationalism, and cosmopolitanism as concepts, ideals, attitudes, and strategies among diasporic groups. Die hier versammelten Studien eröffnen neue Perspektiven auf Nationalismus und Kosmopolitismus. Sie machen deutlich, dass schon vor dem "nationalen " 19. Jahrhundert im Kontext von Diaspora, Exil und Migration Identitäten und Verhaltensweisen entstanden, die zugleich kosmopolitisch und nationalistisch waren. Kirsten Heinsohn, Dr. phil., ist wissenschaftliche Mitarbeiterin am Institut für die Geschichte der deutschen Juden (Hamburg). Susanne Lachenicht, Dr. phil., ist Lehrbeauftragte und Habilitandin am Historischen Seminar der Universität Hamburg. Diaspora Identities: Exile, Nationalism and Cosmopolitanism in Past and Present ? At the turn of the 21st century, social sciences started to re-introduce the concept of cosmopolitanism (Vertovec and Cohen 2002; Cheah and Bruce Robbins 1998; Beck and Grande 2004; Beck 2004). Daniele Archibugi argues that the (post)modern notion of cosmopolitanism consists of three interrelated principles: tolerance, democratic legitimacy and effectiveness (Archibugi 2003, 11). Ulrich Beck sees cosmopolitanism as a 'specific form of social interaction with cultural distinctness' (Beck 2004, 25). Cosmopolitanism now comes across as a positive concept which relies on values drafted by protagonists of the Enlightenment (Kleingeld and Brown 2002), but which has also been tinged by postcolonial or postmodern studies (Nussbaum 1996; Nussbaum and Cohen 1996). Universal human values such as the equality of religions and ethnicities are supposed to co-exist with local, regional, gender, religious, ethnic and national distinctiveness. Post-modern cosmopolitanism is meant to enable people and societies to tackle problems arising from globalisation and the emergence of new nationalisms. It also provides a new paradigm for academic research on nationalism and diaspora in past and present. Social scientists and historians have often claimed that postmodernism left academia with a vacuum with regard to politics, values and ethical standards owing to its inherent relativism. The 'ethical turn' in social sciences and the humanities (Rosenfeld 2006; Davis and Womack 2001; Lubkoll and Wischmeyer 2009) has given rise to studies on (and claims to rights of) indigenous populations, historical ethical standards, minorities and diasporas (Dickason 1997; Berlin 2003; Bloxham 2005; Thompson 2006; Lutz 2007; Gallois 2009). Comparative studies on the interrelatedness of exile or diasporas, cosmopolitanism and nationalism are scarce. Most work on nationalism refers to the modern period, which covers, roughly, the nineteenth and twentieth centuries. Looking at notions and the historical meaning of nations, nationhood and nationalism(s) in a late antique, medieval or early modern perspective could reveal more about the contexts in which nations are shaped and nationalisms arise. Hence in a broader perspective, nations can be defined as ethnic, religious or cultural communities which do not necessarily relate themselves to a territory or a nation-state. However, they do perceive themselves (or are perceived) as a distinct group apart. Dealing with different notions and concepts of nation and nationalism, out of which present-day concepts evolved, a comparative approach to nations and nationalism could help to understand patterns of belonging and separation over time and space. It could also enable historians of all periods to gain from each others' expertise. The formation of distinct barriers between nations was and is meant to protect 'imagined communities' (Benedict Anderson) against other communities that seem to be at odds with one's own community or threaten its very existence. In the modern period, more often than not, nations were constructed within a distinct territory. A leading group attempted to achieve sovereignty for their nation and to maintain their distinct culture, language and sometimes one unifying religion, with one myth about the emergence of the nation and with specific institutions forming the state's government. Those are meant to guarantee the distinctiveness and the economic, political and cultural survival of the nation.